Here is a post-mortem of our Ludum Dare 26 entry, Minimalist Horror Story. Check out our entry here. As the Art Lead, I designed the assets (art and geometry) for the game after doing some concept roughs of our idea. I used 3DS MAX for the models and Adobe PhotoShop for the credits and titles. As a Programmer & Designer I helped define the concept and game play. I designed and created the monster with a combination of a model I asked Eric to make and lighting effects and particles built into Unity. I also programmed the creatures behavior and assisted Brad with character control and scripting the key placement. We initially planned on The geometry in the game to have simple textures but after some tests, we all agreed that the untextured, raw geometry looked awesome in the Unity Engine with default shaders. This made it a whole lot easier for me to build more assets (50+) to make our game even better. Also – we planned the game well – the sketches and idea were very simple. We ran out of time and were forced to leave out some sound effects, which turned out making the game even scarier – the lack of sound between scares makes it more exciting. I think a lot went right. The mood was perfect thanks to some sweet lighting work, the monster works well, the theme was adhered to, and I like how the game controls. We finished a game! That is exhilarating. As a cherry on top, people played it! During development the thought had never occurred to me that strangers would be actually playing this. The comments and feedback have been incredible. I am proud of what we accomplished for our first game. As to development, grayboxing was surprisingly beneficial. We had a plan on paper for the house as well as a design with measurements I worked up the first night for the layout of the house. We ended up changing quite a few things when we could actually run around a graybox of each floor built with unity cubes & planes. This allowed us to change things quickly before Eric had put any time into it at all. 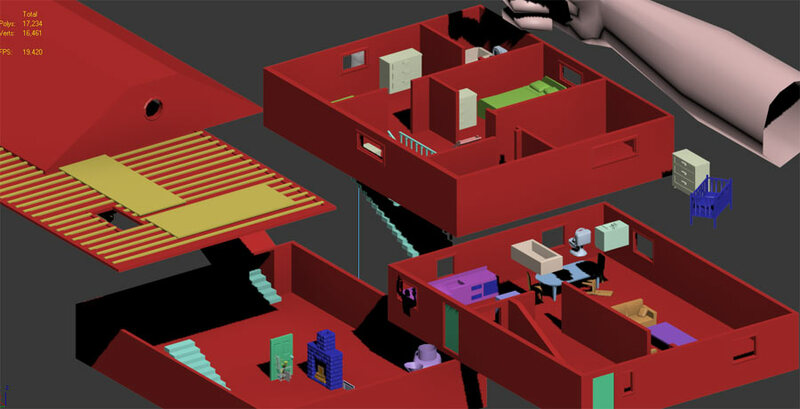 Finally, I exported the final layout as an .obj file so Eric could build the actual geometry in 3DS Max using my layout. Some really good ideas were dropped because of time constraints. We had a shadow that would pop up in a window with light behind it, like lightning… spiders and rats that would fall on the player or run out from under furniture… there were quite a few good ones. The candle burning out didn’t work correctly. I wish we had more time to implement more scares, and there are issues here and there like getting stuck in the attic, lights poking through the level, the rocking chair not working correctly, etc… that we couldn’t address due to the time constraint. Since I was involved in a lot, most of the bugs lie at my feet. This is frustrating, but I am just glad at this point that the game is playable. 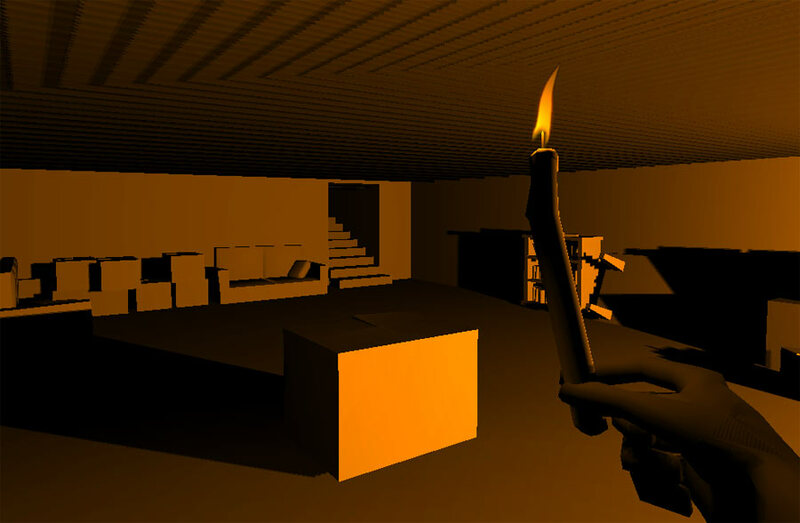 For post-compo, I plan to fix the raycasting on object highlighting, the candle melting sideways bug, plus hooking up all the drawers with the interaction system, adding the doors upstairs, and adding all of the scares we originally planned, including more sounds. Eric built some incredible assets that didn’t make it into the compo version, so I would like to add those in. We had a great time participating. Thanks for checking out our game, commenting, and being such a welcoming community to newbies like us! We will continue to enjoy your great games over the next few weeks! There’s some incredible titles in this competition!